NRI's are less in number in Oklahoma. Due to many reasons, software companies were not developed as expected in Oklahoma state in USA. Anyway, when trying to buy a home in Oklahoma state, take necessary precautions. 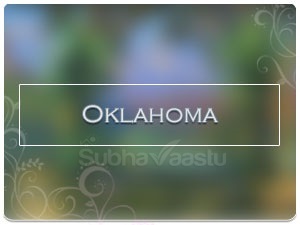 Without vastu consultant recommendation don't buy the house in Oklahoma. Particularly one should be careful before buying the street focus homes. Book knowledge, vastu videos, vastu websites may not help to get the auspicious street focus plot or house. It conditionally requires vastu experts opinion on that plot. On the same way, when there is waterbody, then first check the plot or house with vastu specialist and thereafter decide further to buy or leave that property. Cut in the plot in different directions needs to get recommendations from vastu pandit only. They can provide the appropriate suggestion. Regarding slanting slopes, it requires attention to buy the home. Not possible to get the exact square or rectangular plots or homes in USA, then choose the best home out of worst vastu home. This is suitable in other countries. In India, we may get either rectangular or square plots or homes or flats. But in other countries, it's not easy to get such type of plots or homes. Basement home needs to check the basement position, where is the basement and where is accessing stairs to the basement, these points should be thoroughly checked. Generally, basements never give trouble in some states like in New Jersey, but these may be giving troubles in some states like in Georgia state. Main entrance door, is the main door is towards Southwest, then don't buy it. If the main door is towards the Southeast or Northwest then it requires vastu guru suggestions. 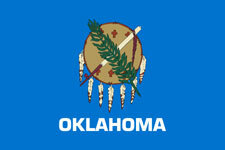 Oklahoma is a US state located in the South-central region of the country. In terms of area covered, the state is 20th largest state of the US while 28th most populous state. The state has is famous for its diverse landscapes, most notably the “Great Plains”, farmhouses, hills, rock formations, forests, wildlife, unique history, and museums. The state became part of the Union in 1907 and became 47th US state. The economy of the state is dependent on natural resources, agriculture, telecommunication, biotechnology, etc. Historians and researchers estimate that the humans arrived in the region as early since the last “ice age” and settled in different parts of the region. At the time of the European arrival, Native tribes or people living in the state were Kichai, Caddo, Pawnee, and Wichita. Spanish were the first to arrive and explore the region followed by the French. The Spanish explorer arrived in the region 1541, but no claim came from their side. It was the start of the 18th century when the French finally claimed the region. During the “Napoleonic War”, circumstances changed for the French and their region was sold to the United States in the famous “Louisiana Purchase”. Afterward, the US influence in the region started and all the decisions were now at the disposal of the US government. Thousands of Native Americans were removed from their ancestral lands and were forced into reserves. 19 April 1995, was the worst day in the history of the state as its capital “Oklahoma City” was hit by massive bombings which killed at least 168 people. Oklahoma is circumscribed by the other US states of Texas towards the South and near-West, Arkansas and Missouri towards the East, Colorado towards the Northwest, Kansas towards the North, and New Mexico towards the far West. The geography and topography of Oklahoma have diverse features having several ecological systems, landscapes, valleys, high-lands, low-lands, fertile plains, lakes, canyons, forests, rivers, creeks and mountain ranges. Flora and fauna of the state are also rich having countless animal and plant species. Approx. 24% of the total area of Oklahoma is covered by forests. Some of the animal species include black bear, fox, lions, badgers, deer, coyotes, etc. Also, most of the environmental and ecological regions of the state are protected by the government in the form of National parks and State parks. Economic sectors of the state are also diverse similar to the geography. Some of the main economic sectors include natural resources (oil, gas, and petroleum), the aviation industry, biotechnology, telecommunications, food processing, agriculture, and services. In terms of agriculture, Oklahoma is the 5th largest producer of Wheat and 5th largest producer of cattle products. Four “Fortune 500” and six “Fortune 1000” companies are located in the state. Ancestor groups of the state include English, Irish, American, German, African American and Native American. English is the official and most widely spoken language of the state while several other languages are also spoken in the state due to the presence of Native Americans. Protestant (a sect of Christianity) is the largest religion followed in the state. a significant amount of Jews and Muslims are also present in the state. Are Street Focus homes are recommended to buy? Somebody discussing about House Chart, what is it mean? Who is the best vastu consultant in Chennai, wish to buy home? My name is Raju which facing home is good as per my birth star? Many friends said Northeast Street Focus home is good, is it correct? Which is the best place for staircase either inside or outside of home? Teja is planning to do trading business, does vastu help to get profits?